The aerospace industry is of the most technically challenging industries in the world. There are growing pressures to look at new manufacturing methods to reduce production times and increase efficiency. One of the determining factors in the production chain is the choice of the right CAM solution. Reduced machining times with high material removal rates of up to 95 per cent require state-of-the-art CAM solutions. 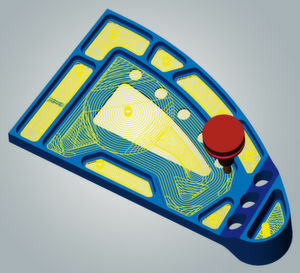 OPEN MIND, a leading developer of CAM/CAD-Software, offers with its CAM system hyperMILL intelligent solutions to meet the challenges rising in the aerospace industry. The hyperMILL CAM software features a broad range of machining strategies, from 2.5D and 3D strategies and solutions for high-speed cutting and high-performance cutting right through to 5axis machining and mill turning. In addition numerous functions enable largely automated programming. Special hyperMILL packages for machining of impeller, blisk and blade machining complete the broad portfolio. OPEN MIND’s aerospace segment - civil aviation, space travel, military, reconnaissance - has industry-proven application expertise when machining engine components, turbine rings and structure parts such as connectors, ribs, housings, and landing gear. Complete machining with just one CAM software and one postprocessor for all turning and milling processes results in integrated practices for minimised machining times, while also increasing reliability. 5axis machining centres are now standard among manufacturing companies in the aerospace industry. Fully exploiting the potential of these machines requires a powerful CAM solution in addition to other components. hyperMILL is one of the technologically leading CAM systems that features a broad range of powerful 5axis strategies. 5axis machining makes it possible to machine challenging geometries, free-form surfaces and deep cavities significantly more efficiently. Depending on the geometry and machine kinematics, the user can choose between 5axis machining with a fixed tool angle, automatic indexing or true simultaneous machining. All toolpaths are generated fully automatically with automatic collision checking and avoidance. OPEN MIND was one of the first CAM manufacturers to tackle 5axis technology. Since then, it has been one of the leading developers of unique and innovative 5axis CAM strategies. The performance package hyperMILL MAXX Machining offers three powerful modules for finishing, roughing and drilling that make it possible to achieve impressive boosts in productivity. Manufacturing companies can realise fast economic benefits when working under increasing time and cost pressure using the innovative strategies.